According to the Chicago Sun-Times, “cancer is the leading cause of disease-related death in dogs over age 2. Fifty percent of dogs over age 10 will be diagnosed with cancer.” With more advanced treatments, dog owners are trying cancer treatments that are usually done on humans like chemotherapy or radiation. 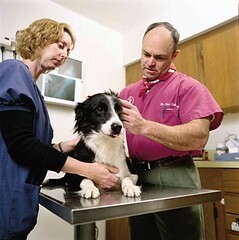 Treatments can cost as much as $10,000 and dog cancer is more difficult to treat than in humans. Many owners don’t have enough money for the treatments or do not want to see their dog suffer while going through chemotherapy. The Morris Animal Foundation is sponsoring a $30 million fundraising campaign for dog-cancer research. This entry was posted on Thursday, May 17th, 2007 at 3:55 am	and is filed under Dogs, National Dog, Cat & Pet Info, Veterinary/Medical. You can follow any responses to this entry through the RSS 2.0 feed. Both comments and pings are currently closed.